Grapes are enjoying a renaissance in New England following recent advances in both seedlessness and winter hardiness. Several breeding programs around the country, including the University of Arkansas, Cornell University, Michigan State University, and the efforts of private grape breeder Elmer Swenson in Minnesota, have introduced numerous new varieties of both seeded and seedless table grapes and cold hardy wine grapes. Before describing some of the more promising varieties for our area, here is a brief review of horticultural information and site criteria for grapes. Grapes are deciduous, woody vines native to many temperate regions of the world. 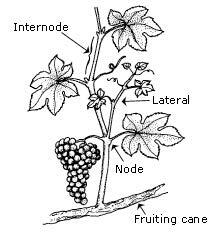 An established grapevine consists of roots, a trunk, cordon, canes, spurs and shoots (see diagram below). The trunk(s) and cordon(s) are the only permanent above-ground structures of the vine and define the shape or training system of that vine. Canes are one-year-old growth retained at pruning from the previous season for fruiting (most of the previous season's growth is removed at pruning). The number of canes and length they are trimmed to varies according to variety, training system and vigor of the vines. Generally, enough canes to provide for 30 to 50 buds for the next growing season are retained. Buds will grow into shoots. Shoots are the new growth produced by canes each year and bear that season's fruit. Each shoot will produce 1-3 fruit clusters. Shoots can grow to be very long and need support from a trellis. Grape root systems are extensive. Most of the feeder roots are in the upper 2 to 5 feet of the soil. However, roots can penetrate 25 to 40 feet in coarse, sandy soils. The ideal vineyard site provides full sunlight, protection from prevailing winds, and is away from frost pockets. Southern slopes are preferred as they can enjoy a slightly longer period of frostfree days and the soil warms earlier in the spring. Arbors or trellises on the south side of buildings can also provide good sites for grapes. Grapes will grow in a wide range of soils but do best in a deep, well-drained sandy loam with a pH of 5.5 to 6.5. The remainder of this article describes recommended varieties of seedless table grapes for New England. is a white seedless grape with excellent, mild flavor and juicy, melting texture. Individual berries as well as clusters are large and attractive with fruit ripening mid to late September. Ripe fruit holds well on the vine, with the flavors improving over a 10-14 day period. Vines are moderately hardy, medium in vigor and productive. is also a white seedless grape with honey-like flavor and melting, juicy texture. It produces large loose bunches of white seedless grapes. Vines are very hardy (to -20°F), prone to excessive vigor and moderately productive. Fruit ripens in early September. A sibling of Himrod, this white seedless is very productive with mild flavored fruit, crisp textured fruit. Clusters are very large and well filled. Ripens later than Himrod, in mid to late September. This variety stores well after harvest. Another sister of Himrod with seedless green to golden berries of excellent flavor. This variety is less vigorous than Himrod, but ripens about a week earlier and is much more productive. These qualities make it good for cool, short seasons. Hardy to about -15°F. a red seedless grape with a unique, strawberry-like flavor. The medium sized clusters produce bright red berries. The skin is slightly tough and non-slipskin. This variety sometimes has noticeable seed traces. Vines are hardy and productive. Fruit ripens early September. a red seedless grape with exceptional fruity flavor and crisp melting texture. The vine is moderately vigorous and among the hardiest of seedless grapes. Berries are medium in size on medium, well-filled clusters. Fruit ripens mid to late September. Fruit quality is among the best of the red seedless types. produces medium clusters with small red berries of excellent flavor. Fruit ripen in early September. This variety is more winter hardy than most seedless grapes but may still sustain trunk injury in some year. produces large clusters of red, medium-sized berries. The skin is tender, and the flesh is melting in texture, with a sweet labrusca flavor. Coloring may be poor in some years, and fruit cracking in wet seasons can be a problem. Vines are very hardy. Fruit ripening is mid to late September. is a vigorous, blue seedless grape. The flavor is mildly labrusca, and the berries are slipskin. Clusters are medium-sized, compact, and resist cracking in wet harvest seasons. Vines are hardy and very robust and vigorous. Fruit production is mid September. Produces medium-sized blue berries. Fruit is of extremely high quality and at its best is an excellent, flavorful seedless variety. Disease susceptibility, tendency for fruit cracking and limited winter hardiness make is suitable only in southerly locations in New England. Fruit ripens mid September. an early maturing blue variety with large, firm, non-slipskin berries on medium sized clusters. Fruit has a distinct muscat flavor and resists cracking. Vines are hardy and of medium vigor. Many of these varieties are grown at the UMass Cold Spring Orchard Research and Education Center (http://www.coldspringorchard.com  ) and the public is welcome to come and purchase them at the orchard store in the fall. Illustrations from the Penn State Small Scale Fruit Production publication and used by permission.